On Wednesday, April 3, 2019, PFLAG Greater Providence will have its monthly meeting from 6:45 to 7:45 pm at the MET School in its Providence location. Please note the change in the meeting end time. Due to schedule changes at the MET School, we have had to change the end time of our meetings. Our start time, 6:45 p.m., will remain the same. We will keep you advised of any future changes. This month's meeting will be a general support meeting. We do not have a speaker scheduled; so this is a good time to come and talk (or just listen) about any issues or concerns involving you or your LGBTQ loved one(s) with those who understand. Meetings are held the first Wednesday of the month. Our meetings are relaxed, safe, and non-judgmental; and all information shared remains confidential. We meet at The MET School in the UNITY Building. If you are driving up Public Street from Eddy Street, it is the first campus entrance on the right after you cross Plain Street. The building is located toward the back with parking in the rear. Please note that while our usual location is the UNITY building on The Met School campus our meeting may be relocated to another building on the campus. If it is moved, there will be signs posted on both buildings and a notice will be placed on social media and this site. ​The meeting at our new Newport satellite location will take place on Monday, April 8th from 7:00 - 8:00 p.m. at Channing Memorial Church, 135 Pelham St. Newport, RI. The meeting will take place in the Parish Hall which is in the back of the church. If you are in need of additional information about our Newport meeting you can reach Doreen at led1pflagnewport@gmail.com, or you can contact PFLAG Greater Providence at pflagprovidence@gmail.com or call our Helpline at 401-307-1802 regarding our Providence meeting or for any other PFLAG information. All are welcome. Refreshments and parking are available, except only street parking is available at the Newport location. PFLAG is a unique organization offering support for families of lesbian, gay, bi-sexual, transgender and gender-nonconforming/questioning people, and for the LGBTQ people seeking to come out into the embrace of their families. We help by telling the stories of our own journeys to understanding and acceptance of our children, and we take a personal interest in every family who attends. ​If you are unable to attend any of our regularly scheduled meetings, our PFLAG chapter will be happy to meet with anyone separately who is in need of information and/or support whether you live in Kent County or any other part of the state. Please contact us at (401) 307-1802 or at the email address below. Contact us at pflagprovidence@gmail.com for more information. Support PFLAG Greater Providence with a tax-deductible donation so we can continue to provide the support, education and advocacy to families in the LGBTQ community. By clicking on the button below, you will be taken to PayPal where you can make your tax-deductible donation either through your PayPal account or with a credit card. Our ﻿brochure﻿ with membership form. 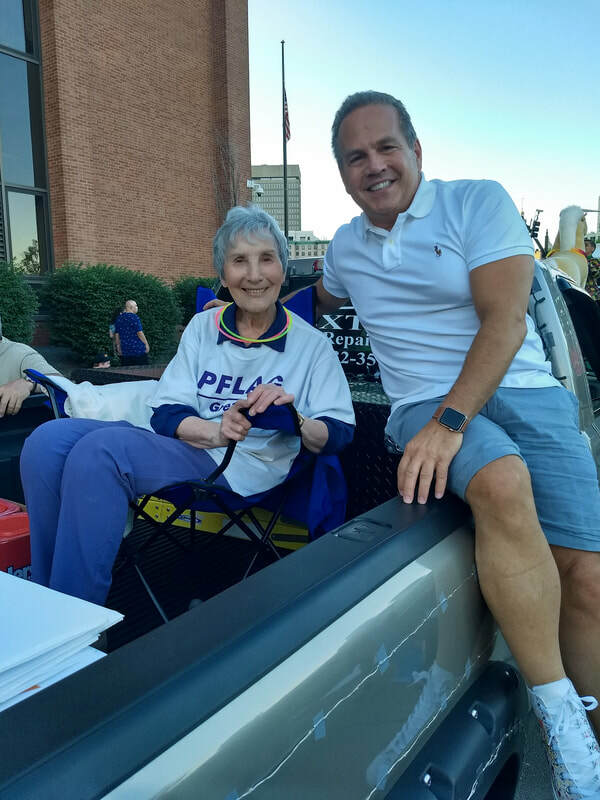 PFLAG Greater Providence Chapter Founder Myra Shays with U.S. Representative for Rhode Island David Cicilline on our PFLAG "float" at the 2018 RI Pride Parade.